I confess, I am glad the weather is lousy. I know I should be clamoring for sunny days and warm temps and yes, yesterday I was whining about how it is never going to be nice outside. But honestly, today I am happy because my options are narrowed way down due to the weather. It is my day off and I am knitting, sewing spinning and sneaking in a movie. Today I worked a tiny bit on Kelsey's dress & pressed the material for my blouse. 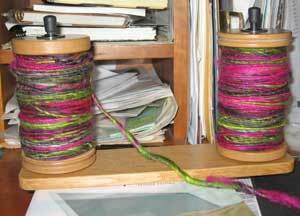 I then proceeded to finish spinning my Targhee from Abstract Fibers. It has to sit a little before I ply it(so I've been told). I am anxious to produce my first yarn to knit with but am trying not to rush through the process Because I was really struggling with the targhee I decided to try the Blue Faced Leicester(bfl) from Mountain Colors. Classic case of wondering if it is hard because I am a newbie, or is it the fiber? It is spinning so much easier.....there must be a learning lesson here but I don't know enough yet, to figure out what that lesson is. Anyone out there have wisdom to share with me? My Noro purse is done and I think it is quite fun. Actually after I was done with it I decided it would be a perfect pattern for handspun.... 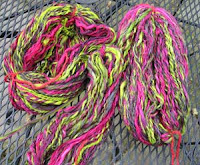 The last two things I am hoping to sneak in are loading the ArtYarns onto the website and working on my brother in law's slippers. Amazing day! One of the hardest things for me to do is to compartmentalize my personal life and studio life. I think that is a common theme for small business owners. Sometimes it is just plain old difficult to shut down one....they seem to merge into this big awesome, daunting, amorphous blob. Last week I was in Charleston, South Carolina and now I am back trying to figure out what I should do first. What I decided to do for now is just get back into info sharing so here I am. One picture from Charleston and one picture from knitting that I was doing while traveling. Charleston has these nostaligic beautiful southern homes with wonderful patio gardens and historic gateways. 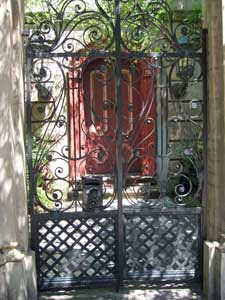 I love peering through the gates to see the lush greenery and vibrant flowering plants. 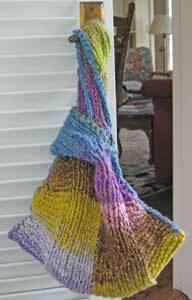 My knitting is a purse project that is from the Noro volume #27. One of our customers had started on one and I was intrigued by the shaping so I decided to start on one myself. 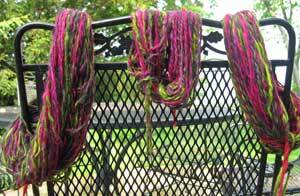 The yarn I am using is Noro Furisode and the one they use in the book is Taiyo. 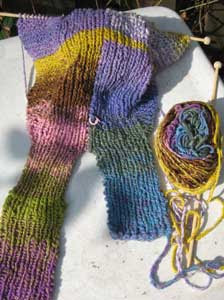 It is going to have a lovely shape and interesting sling effect. Watch for the finished project!